Xiaomi Mi MIX 2S Leaked Photo Appears with In-Screen Fingerprint Scanner - Playfuldroid! Xiaomi is all set to launch the Mi MIX 2S flagship phone on March 27. Plenty of information on the leaked specs of the smartphone have surfaced in the past. None of the images that have been leaked by the rumor mill seem genuine. One of the recent reports had claimed that the Mi MIX 2S is equipped with an in-screen fingerprint reader. Today, a leaked photo of what is said to be the real handset of the Mi MIX 2S has appeared. 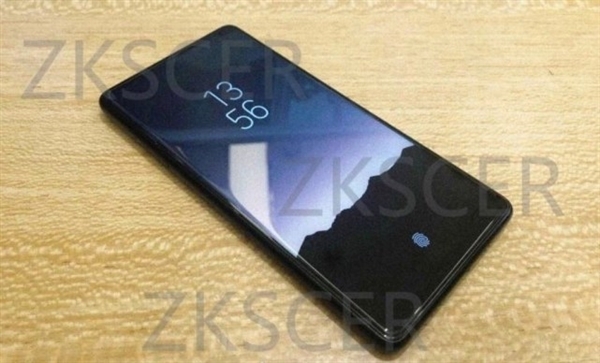 Nothing much can be deduced on the features of the phone through the image, but it seems quite evident that it will be coming in-screen fingerprint reader. The other thing that can be understood from the leaked photo of the Mi MIX 2S is that it seems to offer a very high screen-to-body ratio. Since it is said to be an improved version of the Mi MIX 2 that was launched last year, it may offer a bigger screen space. Xiaomi has already confirmed that the phone is driven by Snapdragon 845 chipset. Fresh leaks suggest that handset may feature 6.01-inch OLED display from Samsung. It is rumored to feature a dual camera setup and one of its camera sensors could be the Sony IMX363. It is the very same camera sensor that is found on the newly unveiled Asus ZenFone 5 and 5Z smartphones.